Large families and organizations prefer the Ford Transit Passenger Wagon for the space and comfort the vehicles provide. The 2019 models make trips even more pleasant via the host of technological features they offer. Get a glimpse of the latest wagons in our Waynesburg, PA inventory. If you're looking for a vehicle that's designed to keep you safe, check out the new Ford Explorer. The Explorer is a popular three-row SUV that's available at Fox Ford of Waynesburg. Whether you're driving through rough Waynesburg streets or tackling off-road paths, this SUV can get you to your destination. It's available with Hill Start Assist and Hill Descent Control features. People have conflicting attitudes when it comes to technology as a whole. There are some people who believe that technology is something that is not necessary. However, the 2019 Ford Ranger has features that show that technology can be helpful when it comes to the safety of others as well as the convenience of the driver. At Fox Ford of Waynesburg, we want Waynesburg drivers like you to lead rich lives, and a Ford Expedition can help you do that. Let's explore the capability features of Ford's largest SUV. Obviously, the largest SUV delivers the most interior space. In the Ford Expedition, you can comfortably seat eight people, but you can also use its spaciousness to haul your favorite cargo for work or play. If you’re in the market for a compact car in the near future, the Ford Focus should be at the top of your list. 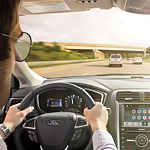 The staff of Fox Ford of Waynesburg in Waynesburg, PA is pleased to offer the new Ford Focus to this area, and we’re certain that you’ll find a model that you’ll love to drive now and for years to come. The entire staff here at Fox Ford of Waynesburg wanted to inform our buyers about the exciting new Ford C-MAX. The reason for the popularity of this compact hybrid has to be partly due to the number of smart features helping make driving easier and safer for motorists. In a world where so many people want SUVs, compact crossovers are extremely popular because they offer the best of both worlds, and the Ford EcoSport fits the bill perfectly. The EcoSport offers a great ride, extra cargo space, a price tag lower than you’d expect and tons of exciting amenities. We’d love to show you all the EcoSport has to offer at Fox Ford of Waynesburg.